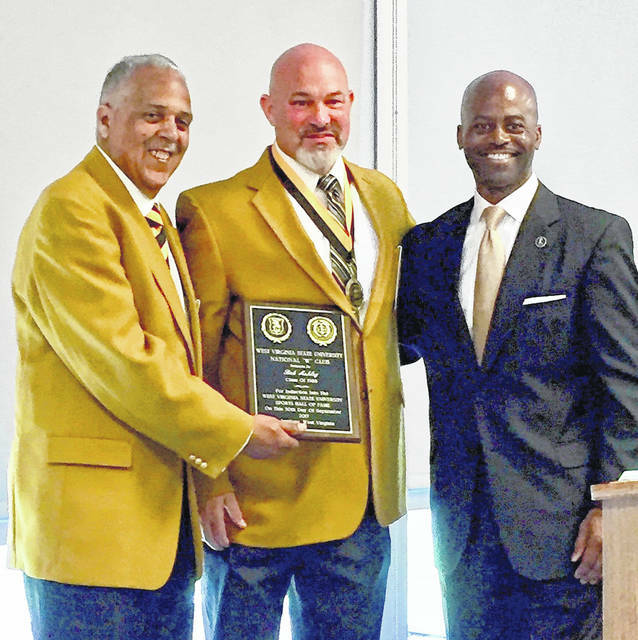 Middleport native Bob Ashley, center, was recently inducted in the West Virginia State University Hall of Fame. Ashley, a 1982 graduate of Meigs High School, is pictured with William Lipscomb (left), president of the National “W” Club and the Hall of Fame at WVSU. WVSU President, Dr. Anthony L. Jenkins, is also pictured at the right. INSTITUTE, W.Va. — Bob Ashley, a Middleport native and a 1982 Meigs High School graduate, was inducted in the W-Club’s West Virginia State University Hall Of Fame. Ashley earned all-conference in multiple sports wearing the uniform of the maroon and gold. He went to the University of Utah after graduation to play for the Utes, under another Middleport native, Chuck Stobart who was the head coach at the time. After a stay in Utah, Bob transferred to West Virginia State to play for the Yellow Jackets. Bob letter all three years at WVSC (1985-87) and was a co-captain in 1987. While there, Bob played linebacker, quarterback and punted. He led the Yellow Jackets in punting in 1985 (40.9 average), 1986 (40.6) and 1987 (43.0). He also holds the WVSU career punting record with a career average of 41.5 yards a kick. His 41.5 yards is also second best in the history of the West Virginia Intercollegiate Athletic Conference, which was established in 1924 and dissolved in 2013. Other awards Ashley received while at West Virginia State: one player of the week against Fairmont State in 1986, the 1987 special teams Most Valuable Player, 1987 “W” Club Award winner, 1987 Associated Press honorable mention All-American, and 1987 Football News NAIA first team All-American. Upon graduation, Bob had official tryouts with the Dallas Cowboys and the New York Giants, and also worked out for the Chicago Bears, New England Patriots, Tampa Bay Buccaneers and the Kansas City Chiefs. The WVSC Hall of Fame is located in the Canty House on the campus in Institute. The facility showcases academic and athletic achievements of WVSC athletes. In 2004, the college became West Virginia State University. Bob is married to the former Michelle Metzger of Lucasville. Bob teaches at Minford Elementary School and is currently the head football coach at Portsmouth Notre Dame. Bob and Michelle have a daughter Gracie. Bob is the son of Sharon Ashley of Middleport and the late Bob Ashley. His father was a standout athlete is his own right at Middleport. Bob Sr. played basketball at Marshall on their all-time great teams in the mid 1950’s with Hall of Famers, Pomeroy graduate Charlie Slack and the great Hal Greer. He went on to be head football coach at Eastern, Warren Local, Southern, Southwestern and Meigs. Dave Harris is a sports correspondent for Ohio Valley Publishing.